Is your injury serious? Did you require hospitalization, therapy, or other medical attention? Was your injury the result of someone else’s negligence or malice? Are you dealing with an insurance company that is giving you the runaround? Do you feel you are being treated unfairly? Is the other party disputing the liability issue? If any of these apply to you, it is time to seek good legal advice. But how do you find the right lawyer for you? There are thousands of lawyers in this country, many of them right here in Florida. So how do you know which one is right for you? What criteria should you use to evaluate a potential attorney? Area of focus: For starters, you want an attorney who focuses solely on personal injury. That means one who knows how to investigate personal injury claims thoroughly. You want an attorney who does not only have experience dealing with medical institutions and the billing issues related to them; your attorney must have proficiency in handling insurance companies whose claims adjusters are working to save money for their companies. Experience: You’ll want to know the volume of cases a firm has in a particular area, how often they bring cases to trial, and what their success rate is. Personal connection: After meeting the attorney, evaluate your impression of the lawyer and the office. Did you get courteous, clear answers to your questions? Did you feel comfortable with the style and carriage of the attorney? Does the attorney seem ethical and professional? Do things appear to be orderly and efficient around the office? Have you been given assurance that your case will be a priority? Fees and payment schedules: Do the fees seem reasonable? Are there up-front costs, or are payments due after the case is settled? Are you comfortable with the terms of the contract? For most people, engaging the services of an attorney can be a little intimidating. 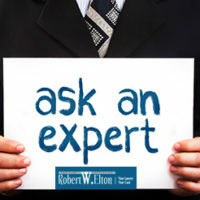 When looking for a personal injury firm, look no further than the Law Offices of Robert W. Elton in Daytona & Ormond Beach. We strive to give our clients the confidence and support they need as we negotiate the complex and sometimes overwhelming issues associated with their personal injury cases. Don’t wrestle with the decision another minute. Our experienced team is ready to fight on your behalf today.